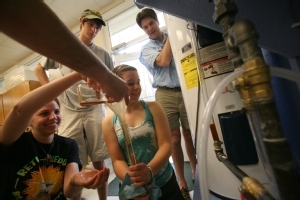 The Commonwealth Center for Energy and the Environment provides a program for faculty to promote interdisciplinary environmental research and teaching, building on the interests and strengths of existing faculty. The program has two components - 1) short-term Environmental Enquiry Groups (EEGs) and 2) Long-term Environmental Quest groups (LTEQs). Together, these provide a mechanism for collaborative exploration of specific environmental issues; such exploration will promote collaborative research, course development and/or proposal development for external funding. The Center will begin with the implementation of EEGs to encourage new faculty collaborations. As success of the EEGs grows, LTEQs will be phased in to cultivate deeper research interactions. Faculty interested in exploring an environmental topic in more depth using interdisciplinary approaches will submit a proposal to form an EEG (e.g., water resources, sustainable land use, climate change, endangered species, renewable energy, rising sea levels, environmental justice, etc.). Many of these proposals will likely provide opportunities for integrating natural sciences, law and policy, social sciences and/or the humanities. EEGs will consist of collaborative groups of five to eight faculty who will explore common interests and opportunities in terms of interdisciplinary and multi-disciplinary research and/or teaching related to a particular environmental issue or question. Approximately three to five EEGs will be selected each year. The designated EEGs will be publicized university-wide, providing broad opportunity for all faculty to apply to participate in any of the funded EEGs. Each EEG will work on their project either during the summer or during the academic year; this work will include regular meetings and might involve discussions of readings, invited speakers, and proposal writing. Each EEG will submit a report the semester following their completion that will include a list of participants, their goals, outcomes, references, proposed activities, potential funding sources, and, depending on the project, an external proposal. If desired, EEG groups might seek additional funding to continue their work, either by submitting a proposal for internal funding to the Center to become a Long-Term Environmental Quest (LTEQ) group, or by submitting a proposal for external funding through public or private grants. The reports of successive EEGs will provide background and create foundations for new additions to the curriculum, resources for larger projects seeking extramural funding, or new research initiatives within the university and the Center itself. LTEQs require greater commitment, depth and disciplinary diversity, and a strong focus on securing long-term sponsored program support for the work. Proposals may emerge from the EEG process or they may arise de novo. Initially there will be one LTEQ group, with up to four in total added as the Center develops. The first instance will occur with a call for faculty proposals to form an LTEQ. LTEQ groups will involve faculty from two or more schools/faculties, and will consist of between five and eight faculty participants and up to three graduate and/or undergraduate students. Proposals will describe how the group will address a particular environmental issue using an interdisciplinary/multidisciplinary approach that will provide opportunities for integrating natural sciences, law and policy, social sciences, and/or the humanities. Proposals will identify a set of deliverable products that will include research objectives, areas for extramural proposals for continued funding, new courses (individual or team-taught), new modules that will be incorporated into existing courses and possible public outreach efforts. Project examples might include studies in areas such as carbon sequestration, renewable energy and biofuels, science and the human dimensions of urban development. The LTEQ group will work for one to two years and will be expected to submit one or more proposals for external funding to support continued work. Proposal budgets will reflect the actual costs of the LTEQ including appropriate stipends and M&O for supplies, conferences, travel, visiting speakers, etc. necessary to the level of the project proposed. Each LTEQ will submit an annual report that will include a list of participants, their goals, outcomes, completed and proposed activities, potential funding sources and one or more extramural proposals. Proposals for EEGs and LTEQs will be due on July 1st, 2013 for the current proposal cycle. Check back for future due dates!